Place pearled wheat, thyme and a pinch of salt in a saucepan. Cover with about 750 ml (3 cups) water, bring to a boil and simmer for 30-40 minutes or until cooked and fluffy. Drain, rinse and allow to cool. Heat 15 ml (1 tbsp) of the oil in a frying pan over medium heat. Fry kassler chops on both sides until golden brown. Add half of the sage. Cover with a lid and simmer for a few minutes or until cooked. Remove meat from the pan and set aside. Keep the pan on the stove and pour in the vinegar to remove any bits that are stuck to the base of the pan (deglaze). Add the rest of the oil and sage to make a salad dressing and season to taste. Place beans in a mixing bowl and pour over the salad dressing. Allow to cool. Meanwhile, slice the meat into thin strips. Add the cooled pearled wheat and meat to the beans and mix through. 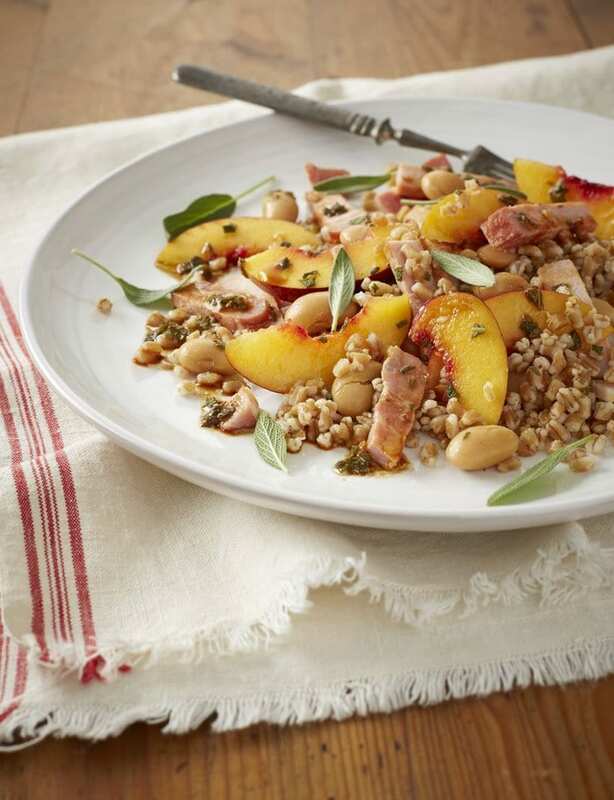 Stir in the fruit, garnish with extra sage and serve. Any firm summer fruit can be used. 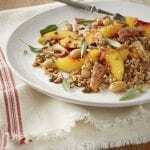 Grapes, figs, nectarines and even pomegranate pips are delicious with the pork and sage. If kassler chops are not available, substitute with smoked ham. Then, just mix the oil, vinegar and sage together to make a salad dressing.